Hello everyone, this month I would like to mention the short term program. We always talk about the Long Term Exchange, but leave out our Short term program which is also very important. Many students may not be able to partake in the long term but the short term also offers many benefits and opens the doors to many other opportunities. The Short term Exchange presents opportunities for students to advance their knowledge and world understanding by allowing them to live abroad for a short period of time over the summer months. Participants also live with one host family for approximately one month under the sponsorship of their local Rotary club.This is a great program where the host brother or sister from abroad will also spend a month with the participating student in his or her home during the same summer. This program still has the same objective as in the Long Term Exchange, in which it is intended to foster world peace and International understanding, the participants can still experience a new culture and meet new people from all walks of life. This year in our District we had 6 short Term Exchanges, I would like very much to grow this program in our district and give this opportunity to more students and who knows it might open up the travel bug in the participant to do the Long Term as well. 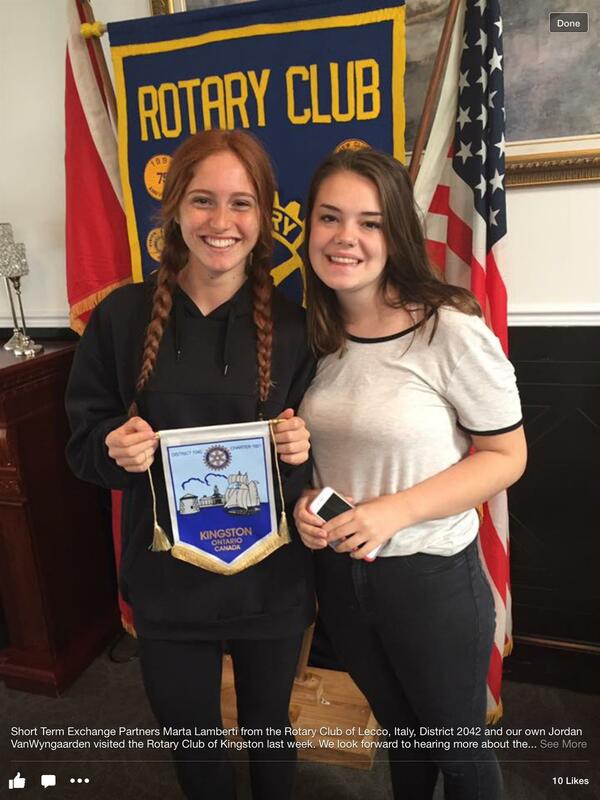 The Picture below is of one of our own D7040 participants Jordan VanWyngaarden pictured on the right, and Martha Lamberti from the Rotary Club of Lecco, Italy, District 2042 who both visited the Rotary Club of Kingston. For more information on how you can send a participant for the short Term Exchange send us an email fontesjoe@gmail.com, or visit our website, http://portal.clubrunner.ca/50214/Page/youth-exchange.